According to Europol, cryptocurrencies facilitate some 4% of the money laundering activities in Europe. Seeking to address this issue, the EU finalized the 5th Anti-Money Laundering Directive (‘AML5’) back in June 2018. These new provisions regulate fiat-to-crypto exchanges, platforms, and custodial wallet providers, giving EU member states a year and a half to incorporate them into their national laws. The latest regulations, however, do not address the issue of crypto-to-crypto exchanges, a fundamental element of money-laundering chains, where transparent cryptocurrencies like Bitcoin or Ethereum get “laundered” through private cryptocurrencies. 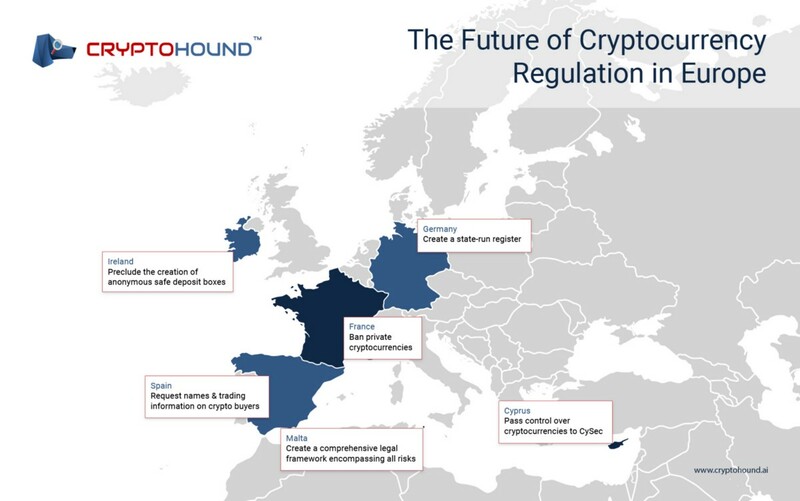 The purpose of this article is to analyze where European crypto AML regulations are heading and define the riskiest currencies to use under this new legislation. The position the EU has taken on cryptocurrencies can be described as decisive, yet slow. On the one hand, the EU is seeking to expand its anti-money laundering regulations so they can crack down on crypto anonymity and embrace crypto-to-crypto exchanges. On the other hand, the European Commission does not want to rush with adopting new laws because they are afraid of hampering the mass adoption of virtual currencies. Cyprus is on the way towards integrating AML5 into its laws, which would put the Cyprus Securities and Exchange Commission in charge of cryptocurrency regulation and enforcement. Although Bitcoin is still reported to be the most widely used virtual currency in money laundering, European police officers have expressed much bigger concerns about lesser-known, private cryptocurrencies. By exchanging BTC or ETH to these secure altcoins, and then exchanging them back, crypto owners can erase any link between the source of funds and the ultimate beneficiary. This process is also known as ‘tumbling’ or ‘mixing’, and it is widely used by those seeking to avoid being traced by advanced blockchain analysis tools such as ORS CryptoHound. Acknowledging the challenge private altcoins pose to AML bodies, the French National Assembly has suggested prohibiting them altogether. Dash — due to the presence of the ‘mixing’ element in its protocol and advanced privacy features compared to its ‘parent,’ Litecoin. In November 2018, the European Commission introduced new regulations to complement AML5. The new provisions now regulate the activities of individuals such as letting agents and art dealers — not just financial institutions. They also oblige cryptocurrency exchanges to abide by the same regulations that are made for financial service providers. These regulations must be fully implemented on a national level by December 2020. Until that time, European banks and financial institutions are not to do business with cryptocurrency owners that show the slightest signs of involvement in criminal activities. Even the failure to confirm ownership or present a tax return on crypto yields could be considered suspicious. The aforementioned provisions, however, will not necessarily put an end to the dissemination of cryptos — rather the opposite. Optimists like Tim Draper, a well-known crypto whale, have highlighted that in five years, fiat money will become obsolete. Only criminals will prefer cash to crypto, as the latter can be more easily traced. De-anonymizing virtual coins has been a major concern for EU countries seeking to integrate cryptocurrencies into their anti-money laundering laws. This can be done by incorporating provisions on crypto-to-crypto exchanges into existing legislation or — a more extreme solution — banning anonymous, private coins or safe deposit boxes. This puts privacy altcoins, such as Monero, Zcash, and Dash, in a tenuous position. The inability to find out whether they were used for laundering transparent cryptocurrencies or not forces law enforcement agencies to be suspicious of any transaction involving secure cryptocurrencies. Nonetheless, EU leaders taking a harder stance on virtual currencies can play an important role in reviving trust in the cryptocurrency market.